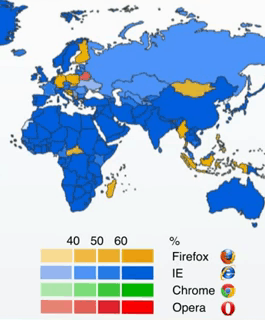 It’s not that we think the pattern of browser use around the world has any significant part in the grand scheme of things. So why are we showing your this animated map? It’s not that we think the pattern of browser use around the world has any significant part in the grand scheme of things. It’s not we even believe the figures put out by StatCounter considering that the research company ignored completely the fact the China’s own Maxthon browser has for years has claimed second place in, naturally, China. And it’s not that we believe the popularity of browsers has anything to do with the quality of browsers or the browsers we would choose to use. The significance of the map just below is that we can’t get enough of animated infographics. If you feel that way too, click and enjoy.